The major in religion provides a broad academic study of religion covering the various religions of the world, including Judaism, Christianity, Islam, Hinduism, Buddhism, Jainism, Taoism, Confucianism, Shinto, African Religion(s), and Native American Religion(s), as well as programs in classical Hebrew and Arabic. The major requires course work in a number of areas of Religious Studies, and asks students’ exposure to more than one religious tradition. The study of Religion is located in the College of Arts and Sciences and in the departmental approach to religion, it demonstrates the important role of religion for the Humanities and the Social Sciences. 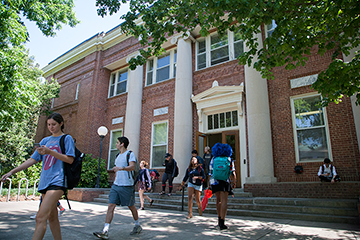 Given this academic approach in a state supported institution, the Department of Religion welcomes students from all and no religious backgrounds, offering no doctrinal preferences or denomination orientations. An undergraduate minor in Religion is good preparation for Law School or Graduate Study in Archaeology, Classics, Comparative Literature, History, Philosophy, Political Science, Religion, and Sociology. Career opportunities for a Religion major include education, public service, civil service, private enterprise, and religious vocations. Arabic is both an Asian and African language. Study of the Arabic language provides exposure to various religious concepts (both traditional and modern and broadens understanding of culture, society and politics. Modern Standard Arabic is ideally suited for students of the Social Sciences considering work or research anywhere in the Arab world (including North Africa); students of the humanities such as History, Art, Music, Comparative Literature, Linguistics, Philosophy, and Religion; or students of Applied Sciences and Business who may be considering work or research in an Arabic speaking country. An undergraduate minor in Arabic is an excellent addition to any CV. One of the most important strategic languages taught at UGA, Arabic offers a challenge to any student with an interest in “seeing the world from another window.” Combined with the Maymester in Morocco and Intensive Summer Arabic Programs that we offer in Marrakech this minor can be earned in two years. It provides a good background to anyone thinking about further studies in International Relations or regional studies in the Middle East or North Africa. Transfer students may transfer two upper division courses in Religion to apply toward the major and one toward the minor. For Arabic Major/Minor transfer credit please contact Dr. Kenneth Honerkamp or Dr. Alan Godlas. An undergraduate degree in Religion is good preparation for Law School or Graduate Study in Archaeology, Classics, Comparative Literature, History, Philosophy, Political Science, Religion, and Sociology. Career opportunities for a Religion major include education, public service, civil service, private enterprise, and religious vocations. In addition, a major in religion provides a sound basis for doing graduate work in many other academic fields.